The Italian term vetro a reticello means “glass with a small network.” It refers to a type of blown glass made with canes organized in a crisscross pattern to form a fine net, which may contain tiny air traps. 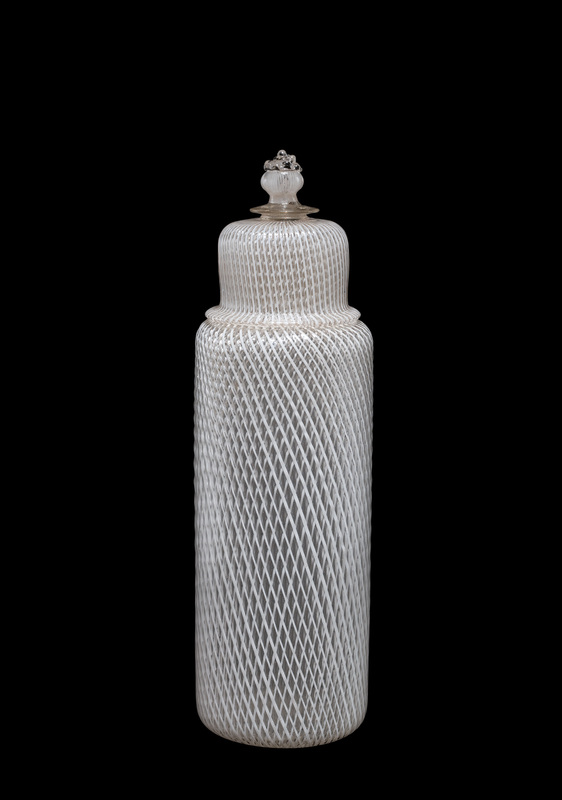 This video shows the making of a reticello bottle and lid. Making reticello begins with making cane. Here, a thin piece of white glass has been overlaid with clear, and it’s being coated again with more clear glass. 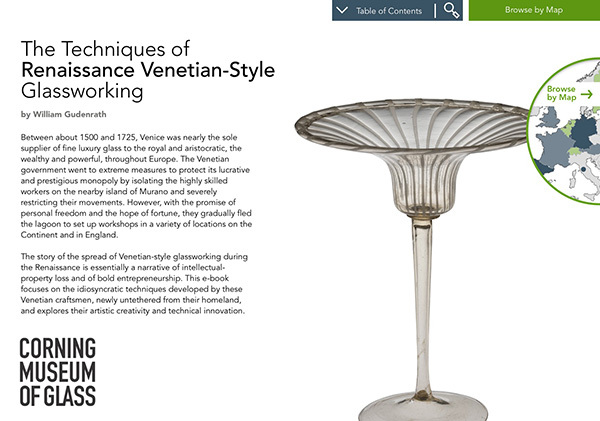 In late 17th-, early 18th-century Venetian objects, again and again, we see a very thick layer of clear over the white core. Here, a third gather has been made. Marvering is used to equalize the temperatures, and the tip is dipped in water to freeze it. The mass is attached to another rod and pulled. Often the pull is 40 to 50 feet in length. The ultimate diameter will be about six millimeters. After cooling, the canes are cut to length. They’re placed on a ceramic plate. The matrix of canes is measured carefully, and a collar is made on the end of a blowpipe to correspond to its length. The diameter is carefully checked, the post put on hold, and the canes heated. The canes are heated to a temperature at which the glass becomes slightly tacky. The end pieces are removed, and the canes are given one last reheat before being rolled up on the collar. The gap is closed, and the mass is marvered carefully to close any gaps. This is the process of making the cup, the first part of the reticello, so the end must be closed. The excess glass is trimmed away, and after repeated reheating and marvering to make the mass smooth, the tip is marvered, holding it in place, and this begins the twist. This twist will be clockwise. The tip is dipped in water to freeze the glass, and after reheating, the end is held and the pipe turned to further tighten the twist. The constriction or neck being made close to the blowpipe will ultimately be the bottom of the cup. A constriction is made at the end of the bubble. The excess knocked free, and this creates a hole. The soffietta is used to shape the lowermost part of the bubble, and after reheating, the final opening process takes place. The cup is broken free of its blowpipe and placed in an annealing oven, upright. The same process is repeated, only here the twist is counterclockwise. The cup is heated to about 1000 degrees Fahrenheit, the insert is prepared, and at the right moment, the insert is lowered in and blown forcefully. This welds the two parts together. It’s at this moment that the bubbles are formed at the intersection of every four canes. At this point, glassblowing can begin to create the object. Because the vessel consists of two parts, the outermost part is divided, transferred to another blowpipe, and this will become the lid. The lowermost part of the vessel is shaped. It’s transferred to the punty, broken free of the blowpipe, and reheated. The uppermost part of the vessel is now ready for shaping. Excess glass is trimmed away, and the top of the vessel is given its final shape. The vessel is broken free of the punty in the annealing oven for slow cooling. The part previously transferred to the other blowpipe is reheated and marvered to get the glass soft, and blowing and elongating is used to begin forming the lid. The part of the reticello set up closest to the blowpipe will be used shortly to create part of the finial at the top of the lid. A small amount of glass freshly gathered from the furnace is added to the tip of the lid. This will become a merese. The lid is transferred to the punty. The lid is opened and measured to fit the vessel. While finishing the lid, the part of the glass remaining on the blowpipe has been reheated and prepared for the finial. To complete the finial, it’s necessary to repunty the lid. After the excess glass has been trimmed away, a tiny amount of clear glass is added to the tip of the finial and embossed with a raspberry-prunt tool. The finished lid is then broken free of the punty and placed in the annealer for slow cooling.